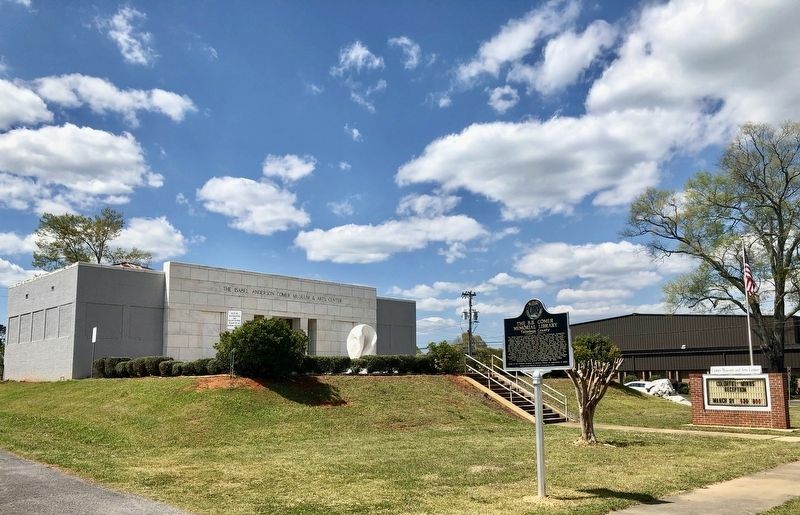 The Works Progress Administration (WPA), the Sylacauga community, and the state of Alabama, constructed this library in 1939. The building is the result of $16,588 from raised local funds including a $5000 donation for furnishings from the family of the late Gov. Braxton Bragg Comer, for whom the library is named. The WPA donated $11,391 and included labor and supplies. The city dedicated the new library on November 21. 1939, on March of Progress Day, a day set aside to celebrate city growth and accomplishments. Because of this centrally located library. twelve county library stations opened, with two locations being available to African-American library patrons. After the close of the WPA in 1943, American Legion Post No. 45 purchased a bookmobile to circulate among the county stations. The library is an excellent example of Moderne architecture and is distinguished by locally quarried Alabama marble. The WPA commonly used this architectural style when designing public buildings. 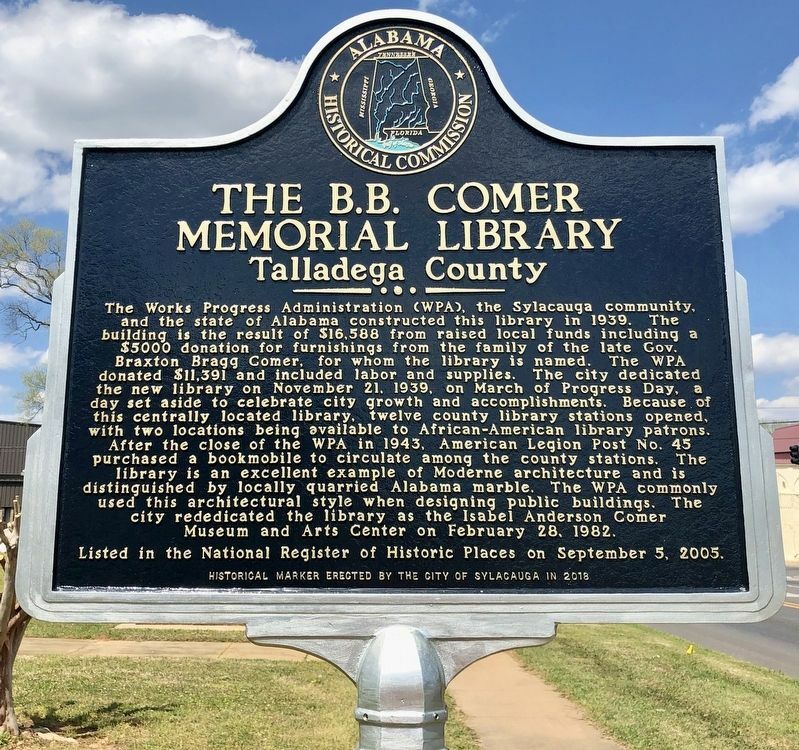 The city rededicated the library as the Isabel Anderson Comer Museum and Arts Center on February 28, 1982. 2. The former B.B. Comer Memorial Library and the marker. Location. 33° 10.643′ N, 86° 15.048′ W. Marker is in Sylacauga, Alabama, in Talladega County. Marker is at the intersection of North Broadway Avenue (Alabama Route 21) and West 8th Street, on the left when traveling north on North Broadway Avenue. Touch for map. Marker is at or near this postal address: 711 North Broadway Avenue, Sylacauga AL 35150, United States of America. Touch for directions. Other nearby markers. At least 8 other markers are within 2 miles of this marker, measured as the crow flies. Hightower Brothers Livery Stable (approx. 0.4 miles away); Sylacauga Historic Commercial District (approx. 0.6 miles away); Marble City Cemetery Sylacauga (approx. 0.6 miles away); Sylacauga Cemetery (approx. 0.7 miles away); a different marker also named Sylacauga Cemetery (approx. 0.7 miles away); Fort Williams (approx. 0.7 miles away); Sylacauga Marble (approx. ¾ mile away); Sylacauga (approx. 1.4 miles away). Touch for a list and map of all markers in Sylacauga. 3. The former B.B. Comer Memorial Library. Now the Isabel Anderson Comer Museum and Arts Center. A large cut piece of locally quarried marble is on the far right and a sculpture using the marble is at front of Museum. More. Search the internet for The B.B. Comer Memorial Library. Credits. This page was last revised on April 2, 2019. This page originally submitted on April 2, 2019, by Mark Hilton of Montgomery, Alabama. This page has been viewed 40 times since then. Photos: 1, 2, 3. submitted on April 2, 2019, by Mark Hilton of Montgomery, Alabama.